Would you like to have something that helps develop your kids spelling and vocabulary? 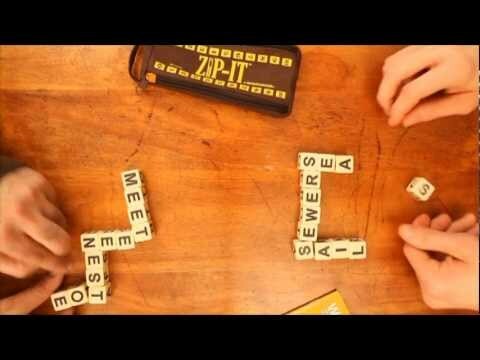 If you enjoyed playing Bananagrams, you’ll also love this exciting word spelling game. The reason that it’s so popular and so much fun is that unlike some traditional ones, with the Zip It game you can go ahead and play without having to sit idly while your opponent plays. (check price on Amazon) a game of skill as well as speed. The game is meant for two players at a time, but you can play tournaments if you’re having a party where the winner of each game faces off in a championship. It can also be played by one kid alone, making it a great solitaire. The wooden blocks in this game really are big enough to read for everybody. But they’re sturdy enough to play outdoors, anywhere you want to go. Not only are these blocks easy to keep up with indoor or outdoor, they’re the perfect games for kids to take along on a picnic or on a trip to the beach because they’re built for outdoor play. The Zip It game is perfect for is for teaching kids how to spell words or for helping them improve their spelling. This game makes it fun to create words and it´s a good practice for scrabble too. Each of the players gets to take 12 of the 24 letter cubes from the pouch. These letter cubes have four sides and on each of the four sides, there’s a letter of the alphabet. Using any of the four sides during play, each player tries to create words by using up all 12 of his blocks. The players get to score by using up their letters before their opponent does and when they do score, they move the zip up one place on the zipper score keeper that’s printed on the outside of the holding bag. Each time a player beats his opponent, it’s one move on the zip or one round. The player that gets to 10 zips first wins the game. Have a quick look at the description here on Amazon. You’ll also get a handy guide that can show you other ways to use the blocks for game play. Some younger kids like to put the blocks on top of one another in order to spell out words and that’s okay, too because the game works horizontally or vertically. The merchant recommends this for children age 8 and older, but we played it with a girl age 6 who is good in spelling and had lots of fun. This is a fun, affordable spelling game for kids that’s great to do for a challenge at parties or for a holiday get together with family. P.S. Please follow me on the next article where it´s about the Angry Birds Knock on Wood Game.